If you have ventured into the heart of Brisbane lately you will probably have noticed people riding scooters. In fact, there is no escaping them. They seem to whiz by at an alarming rate whether you are on the road or footpath and, because they are so quiet they have passed within millimetres of you before you even realised they were there. Lime scooters is one of the largest electric scooter share companies around the world and riders can simply unlock a ride by using their smartphone – it’s easy, affordable, fun and convenient. The company launched LimeBike in June 2017 at the University of North Carolina with 125 bicycles and quickly expanded from there. So successful was the company that in 2018 it was valued at $1.1 billion dollars and secured its place as a unicorn (A unicorn is a privately held start-up company valued at over $1 billion). The success of this start-up did not go unnoticed and in May 2018 they rebranded as “Lime” and partnered with Segway to produce new scooters that would ultimately follow the ride sharing model they had started with bikes. You will find Lime scooters all over the world and in Australia they are in Sydney, Melbourne and Brisbane but of late they are being noticed for all the wrong reasons. Questions relating to safety and speed are now being raised as quickly as the over confident scooter rider weaves his/her way in and out of traffic and around unsuspecting pedestrians. The scooters are run via an electronic battery which enables the scooter to reach speeds of up to 27kms per hour which is almost three times the maximum legal speed of a mobility scooter that is regulated at 10kms/h. Many people have asked whether Lime scooters should in fact be registered in the same way a car or motorbike is and it’s probably a fair question to raise. A vehicle is defined as a thing used for transporting people or goods and under Queensland Legislation requires all vehicles used on roads to be registered. Owners of registered vehicles are also required to be covered by Compulsory Third Party (CTP) Insurance which is attached to the registration. CTP Insurance covers all drivers against legal liability should they cause an accident that results in the injury or death of another person. If a pedestrian is hit by a user driving a registered vehicle, they may be able to make a claim against this insurance. There are some circumstances where a vehicle is not required to be registered, such as a low-powered or walking speed vehicle that has a motor with a maximum output of 200W or cannot go faster than 10km/h. However, as Lime Scooters are powered by a 250W electric motor, which make them capable of reaching a maximum speed of 27kms/h, arguments were raised that they don’t meet the 10km/h rule and should therefore be required to be registered under Queensland law. To address this anomaly the Queensland Government amended the legislation in December 2018. A new provision regarding ‘personal mobility devices’ was added which effectively allows Lime Scooters to avoid registration. A user must not travel on a road with a speed limit more than 50km/h. A user must give way to pedestrians. A user must travel a sufficient distance from a pedestrian to allow for safe stopping. A user must travel at a speed that allows the user to stop safely to avoid collision with a pedestrian. A breach any of these laws can incur a maximum fine of $2,611 for the operator of the scooter. The new legislation also fails to clearly define ‘reckless behaviour’, and as such there is little protection for all road and footpath users. Who foots the bill in the event of an accident? For users of these scooters and scooter services it is important to note that as they are not required to be registered, they will not be covered by a CTP insurance. 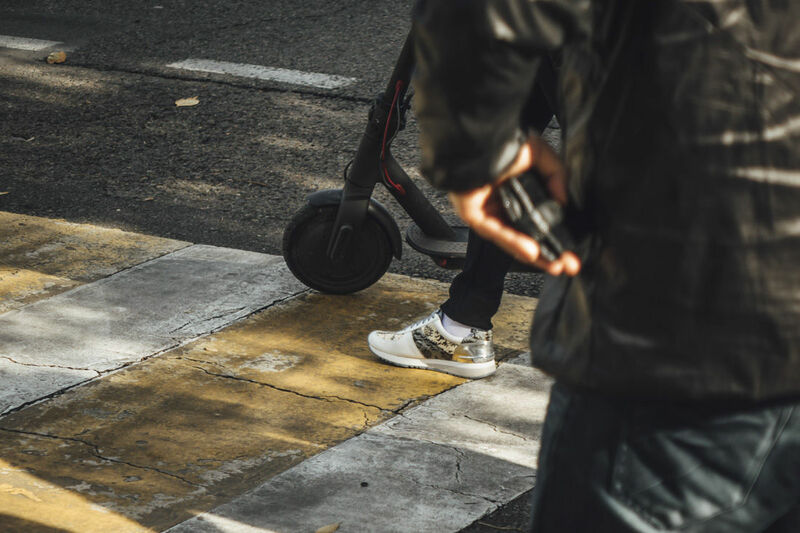 In the event of a serious accident involving a pedestrian on Brisbane’s city streets the scooter rider will likely be liable for any damages. And with no CTP insurance an injured pedestrian may be left seriously out-of-pocket with no legal recourse against a negligent scooter rider who has no financial means of paying recompense for the damage caused by their actions. And for those riders who have household insurance that covers them for the damage they do, their Public Liability Insurer will be none too happy about the increased risk they are now having to cover! How long will it be before the Home and Contents policies start to exclude damage caused while riding a hired scooter or mobility device? As Lime Scooters have the potential to reach almost three times the speed of mobility devices, in the event of a collision the pedestrian is likely to come off second best! To date two Brisbane scooter users have reported being injured while riding around the city. One suffered a fractured pelvis and fibula another suffering a broken tibia, cracked femur and shattered ankle. In the US, class actions have started against both the operators and manufacturers of electric scooters citing that “the companies knew the scooters were dangerous and deployed them in a way that was certain to cause injuries”. While there are no official Australian statistics on the injuries caused by electric scooters it is only a matter of time before there is data that confirms what we already suspect – that injuries to both users and pedestrians have risen sharply since the introduction of scooter ride sharing services – and that many of the victims are financially, physically and emotionally worse off as a result of little to no legal protection. It looks like fun, but there’s a discussion about scooters on high volume footpaths that we need to have.